Look to the left everyone – you will see we have a real secretary (instead of an acting one) thank you Pam for taking this on. Takes lot off the shoulders of others. State Championships: (Last things first): These took place Sunday 11th, perfect weather for racing even if we did have to use a temporary pontoon for loading, the permanent one being under water!! The big news of the day – Congratulations to Megan Jones – your Club now has four Level 3 sweeps. Megan’s sweeping was flawless – we all knew she would cope extremely well; Megan was only one who was not confident in her ability. Race Results – excellent – I know we were all hoping for a first in the Country Cup but we were up against much stronger competition this year and there were more entries. I am just so stoked the way our members are, not only improving times but are pulling up well after racing. Its seems the days of ‘I don’t think I can cope with another race’ (after just two races) are gone. Some members were paddling with both Club and the Sthn Region State Squad (in case of Megan and Bella the Torpedoes), most were in 7 races, some in 8 or 9 – and this is 500m we’re talking about, add to that the 500m paddle to the start line – you can do the maths yourself. Results for Colour City below – with comparisons – which speak for themselves – take note – not a single 2mins.30 something in sight this year, give yourselves a pat on back, you’ve really earned it. The Torpedoes (from nth coast) – with five of our Junior members, won the junior championship against some very strong competition from Snow Mountains team. Take Hayden, Taylor, Megan, Elise and Bella out of the equation and it could have been a very different result. James Sheahan High School –took home their third trophy from three regattas. For such a new team their times were impressive with 2.29.76 in the final, giving them third place. Most of this team is now knuckling down to study for the HSC but maybe at the end of it we will see a few of them in the boat with us. On other hand the school just might be enticed to enter a team in the High Schools regatta in May. Hayden managed to break a finger – don’t ask how! The Jones Family had an altercation with a roo on the way up to Penrith. The Log Cabin – where half the team planned to stay – burnt down Friday night; fortunately Kristy who is now living in Lithgow had plenty of room for a few unexpected guests Friday night – ironic to think it was Kristy who organized the accommodation at the Log Cabin – ended up having to provide more than she planned for. All in all, an eventful and exciting weekend. Down to Earth – life goes on in the Club. In contrast to previous years when, after CNY the numbers training takes a dive, we have this summer seen numbers on par with pre CNY. Training continues three times a week until end of daylight saving, then weekends only. Days and times will be discussed at general meeting Wednesday. Now we have our road boat trailer we are planning a few trips away to explore dams and/or rivers during the winter months. 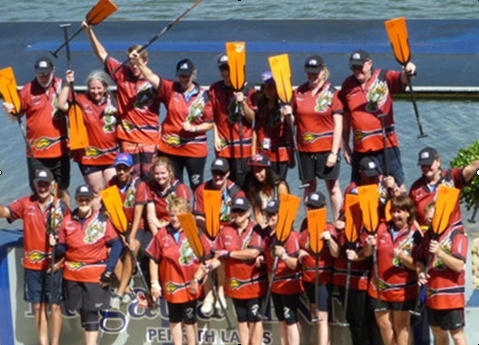 Membership – we have quite a few people paddling with us who for various reasons have chosen not to take out membership – often due to close of financial year being only 3 1/2 months away. From today DBNSW have reduced their component of the membership fee from $85 to $50 (to end of current financial year) The Club Committee have decided to waive the Club component, so if you’ve been thinking of taking out membership or know of someone who has, now is good opportunity to join. For Juniors the DBNSW fee is just $20. This means those people paying casual paddling fees, you can become a member for rest of the current financial year for just $50, juniors for $20. As you read this newsletter you will realize theres still lots happening so if you’d like to take m/ship, see Yvonne or Pearl or go onto the DBNSW website, hit the Membership tab at top of page, click on Clubs on Line that will take you to the place you need to be. Rotary of Orange Calare – Christmas Stocking Raffle – remember all those hours spent selling raffle tickets – in case you missed the news, you helped earn $6000 for Dragons Abreast Orange and CCDB Club – a huge thank you to all who gave up time to help with this project. And THEN a few members of Calare Rotary undertook a fundraising bike ride from Batlow to Orange – with quite a few detours and in the wettest week, resulting in a cheque being presented to Dragons Abreast Orange for yet another $6000. This will be shared with Colour City Dragons as we all work together to develop our Club and provide all the equipment needed. Western Regional State Squad – There is no slacking off for those members heading to Melbourne for the National Championships in April. Those who went to Jindabyne for training combined with the Southern Region had a ball, at the same time discovering they had strengths they’d never dreamt of. Literally four hours intensive training with just one short break, testing our balancing skills on the outrigger canoes, a couple of hours to freshen up and then back for a 2km race. The biggest surprise most had was – they felt good after it, with enough energy to party that night and then turn up for racing next day for the Flowing Festival regatta. Don’t be surprised to see an OC1 included in the training schedule next year!! Sandy enjoyed her first experience as a volunteer at Jindabyne Regatta, it was nice for Club members to see a familiar face. Regattas couldn’t happen without volunteers and it is fun to be part of the running of event, especially when someone else does all the thinking and planning. Sandy and husband Des stayed on in Jindy to do some fishing – Des isn’t telling how many fish he caught!! But Sandy tells me they enjoyed trawling around Lake Jindabyne. Ord River Marathon: June Long Weekend: The eleven members (plus Shona from Pan Dragons) doing this paddle, fronted up with some trepidation for the first endurance training session. We laughed, talked and sang our way round the Lake for little over an hour nonstop, racking up close to seven km. Not much in the scale of things but ten km is next target. The group were unanimous that the session would have been much tougher without Bella who kept us entertained for the duration. If anyone wants to join us in these sessions we’d love to have you on board with us. Next one is this Saturday, the 17th , at 9am or thereabouts. 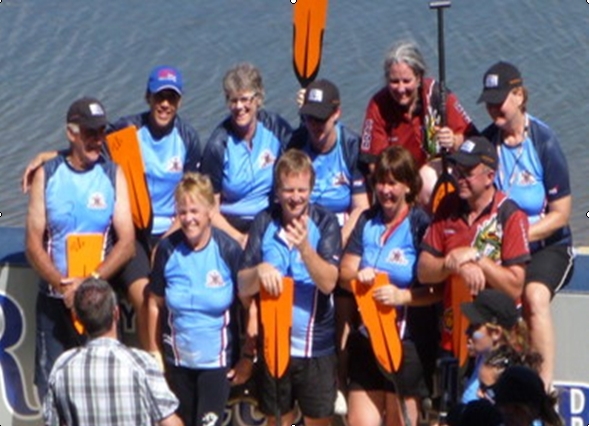 Orange Bush Nippers – will be joining us for a session on the water, after endurance training. That’s about 10.15. Ophir meat raffles: 17th Bud and Ella are rostered. Beeby’s for the 24th – is there someone who can fill in for them – Phil and Jo will be in Moruya for the final Squad training session. Pam’s slice drive – your orders should have been back with Pam by now, the order will be going in tomorrow. Tues. The One Hundred Club is almost completed, thanks to those members who have taken ‘squares’ and to Ella and her work colleagues who have taken so many in last week. The latter two fundraiser efforts will help just a little, to defray cost of uniforms for those 15 members, (10 seniors, 5 juniors) who will be representing NSW at National Championships. 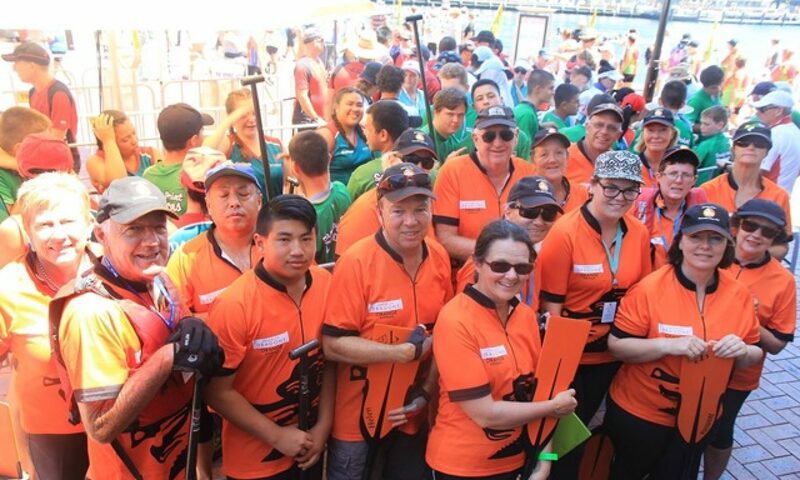 Their efforts can only help lift the profile of Colour City Dragon Boat Club – which can only help all members.